Where Gold Medal grooming and Reliable Snow come together to create a Nordic skier’s dream. Easily accessible from the town of West Yellowstone, Montana, the Rendezvous Ski Trails consist of over 35 kilometers of gently rolling, beautifully groomed trails that wind through tall stands of lodgepole pine and open meadows. The trail system is located entirely on U.S. Forest Service land and it is managed through a cooperative partnership between the Forest Service, the West Yellowstone Chamber of Commerce and the West Yellowstone Ski Education Foundation (WYSEF). We hope that you will visit West Yellowstone and ski the Rendezvous Ski Trails soon! A 5km course will take skiers and snowshoers around the Rendezvous Ski Trails. Four feed stations are staffed by volunteers and offer snacks and water to participating skiers. Skiers can casually stride from station to station, revel in the winter landscapes, refuel with friends and explore the trails in a relaxed, noncompetitive atmosphere. Finish off West Yellowstone's amazing winter season with the Yellowstone Rendezvous Race. Your race starts with the blast of a cannon and ends with you happy and tired! Choose from 5k, 10k, 25k (skate or classic), or 50k skate. There's something for everyone at the Yellowstone Rendezvous Race! Get your First Tracks here in West Yellowstone! Whether it's your first tracks of the season or your first time on skinny skis, the Yellowstone Ski Festival is the place to go. 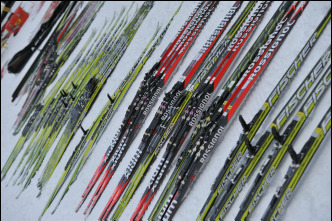 From clinics for skiers of all ages and abilities to world class races to the latest and greatest gear, you can find anything and everything for cross country skiing at the Yellowstone Ski Festival in November. If you want to take your cross country skiing to the next level, but aren't quite ready for the Olympics, why not check out the local citizens races? Monthly "Spam Cup" races let skiers of all ages and abilities get out and get on snow. Maybe you're a good skier, maybe you're an excellent marksman, but have you tried the two together? Now is your chance with the monthly Biathlon races hosted in West Yellowstone.